A powerful explosion shook southern Beirut, a stronghold of Hezbollah, on Thursday and smoke was seen rising from the area. Minutes later at least 4 bodies were found at the scene of the Beirut explosion, with over 77 people wounded, 67 of them left hospitals, according to Health Ministry. Head of Operations of the Red Cross George Kettani told LBCI that they have not yet determined the number of victims killed in the explosion, adding that buildings will be searched to rescue the injured. Civil Defense teams managed to put out part of the fire that erupted in the aftermath of the blast. For his part, caretaker Minister of Health Ali Hassan Khalil urged citizens to evacuate the crime scene and head to the nearest hospital in order to donate blood to help the wounded. He also called on all hospitals to receive and aid the injured. Caretaker Interior Minister Marwan Charbel told LBCI that security violations take place in all the countries around the world, stressing that fighting terrorism cannot be implemented by the security forces, but through dialogue on the part of the country's political forces. State Commissioner to the Military court Judge Saqr Saqr tasked the military police and Lebanese Armed Forces Intelligence with examining the crime scene and launching an investigation in the attack. The explosion took place in al-Arid Street in Haret Hreik near Jawad restaurant and ambulances are currently rushing to the site to transport the wounded. It was only meters away from Hezbollah's political council, sources said. In this context, Hezbollah sources told LBCI that the Haret Hreikh explosion did not target any official from the party, noting that the party’s political bureau located near the site of the explosion did not sustain any damages. The blast is speculated as being the result of an explosive laden car parked in the vicinity of the Haret Hreik area, south Beirut which has been hit by a series of bombs in recent months. Hezbollah's Al-Manar TV reported that preliminary information indicates that a burning SUV vehicle, a double parked Grand Cherokee, remained in its place after the explosion. The owner of the Grand Cherokee said she had sold the vehicle to Mohamad Ezzeddine who sold it in turn to “Sami al-Hjairy” who hails from the northeastern border town of Arsal. The National Committee of Disaster Management called for an urgent meeting at the Grand Serail in order to follow up on the developments regarding Haret Hreik explosion. This as sources reported that clashes erupted between Tripoli’s Jabal Mohsen and Bab al-Tebbaneh. On Tuesday November 19, a double suicide attack targeted the Iranian embassy in south Beirut’s Bir Hassan region, killing at least 23 people, wounding 146 and damaging buildings in the embassy compound. The Abdullah Azzam brigades, a Lebanon-based al-Qaeda affiliate, said it was behind a double suicide attack on the Iranian embassy. In August, a powerful car bomb tore through the Beirut Southern Suburbs' region of Roueis, a stronghold of Hezbollah, claiming the lives of 27 civilians and leaving more than 289 wounded. Similarly on Tuesday July 9th, a large explosion rocked a stronghold of the Hezbollah group south of the Lebanese capital, setting several cars on fire and causing an estimated 53 injuries, security officials said. The blast was caused by a car bomb in a parking lot nearby the Al-Hussein Bin Ali technical school. Just last week, a car bomb rocked the commercial district of Beirut targeting the convoy of former minister Mohamad Chattah. 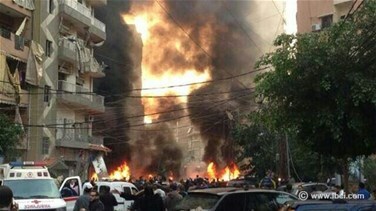 The explosion in Beirut's Starco claimed the lives of 8 persons, including former minister Chatah, and injured 71 others. With skirmishes between Shiites and Sunnis on the rise around the country, religiously mixed and highly fragile Lebanon is increasingly buffeted by powerful forces that are dividing the Arab world along sectarian lines. Some Syrian rebel groups, which are predominantly Sunni, have threatened to strike in Lebanon after Hezbollah joined Syrian President Bashar Assad's troops in their battle against opposition fighters. "Around 4:06 p.m. on Thursday, an explosion quivered Al Arid street in Beirut's Haret Hreik region, causing a number of casualties and heavy material losses. The army forces deployed in the region and cordoned off the area as the forensic evidence units rushed to the scene along with experts, who began inspecting the site to determine the type and circumstances of the blast's occurrence." The army also called on citizens to avoid massing near the blast's spot for fears of another explosion and to facilitate the work of apparatuses in transporting the wounded to hospitals. President Michel Sleiman stressed that “the terrorist hand that struck the Beirut Southern Suburbs is the same hand sowing the seeds of strife and hatred across the country." This as caretaker Prime Minister Najib Mikati denounced the attack, blaming terrorism for preventing the country from reaching stability; stressing the need to hold dialogue in order to reach an agreement. Meanwhile, Prime Minister-Designate Tammam Salam said that raising awareness and increasing the chances of an agreement between rival parties are the only means to respond to this attack. Speaker Nabih Berri stressed that those who assassinated former minister Mohamad Chatah are the ones responsible for all the attacks that targeted the Beirut Southern Suburbs and the northern city of Tripoli. For his part, caretaker Foreign Minister Adnan Mansour told LBCI that the attack comes in line with terrorist acts that are striking the region, pointing out that fighting this crisis can only be carried out through complete cooperation between the Lebanese security apparatuses and countries with experience in fighting terrorism. Similarly, former PM Saad Hariri described the Dahiyeh explosion as a “demonic act aiming at murdering innocent people and spreading chaos and destruction,” noting that terrorism cannot be described with words. Future Bloc member, Ammar Houry, blamed Hezbollah's involvement in the Syrian crisis for the attack saying "Hezbollah opened the doors of hell onto Lebanon." For his part, the leader of the Kataeb party Amin Gemayel told LBCI that the only way to respond to the criminals who are breaching Lebanon’s security is when the rival political parties reach an agreement to resolve the country's internal issues. This as, MP Walid Jumblatt called on all political forces “to be modest and attend dialogue session in order to put an end to the bloodshed,” slamming reports stating that there is a competition between the security apparatuses. Syrian Information Minister Omran Al-Zoubi said that Syria strongly condemns the “terrorist attack” that targeted the Beirut Southern Suburbs, stressing that the fight against terrorism is every country’s obligation. This as the US embassy in Beirut condemned the blast and offered it condolences to the families affected.